By keeping a close eye on your cat's ears, you can help head off the painful symptoms of infections or ear mite infestations. Have you ever watched your cat’s ears twitch when he hears something interesting? Of course you have. It’s fascinating to see how felines can angle their ears in the direction from which a particular sound is coming and even move each ear independently of the other. They can do that because each ear has 32 muscles that enable the cat’s directional hearing. To keep those mobile ears in tip-top condition, it’s a good practice to examine them at home on a regular basis for signs of infection or mite infestation. Here’s what you should know about keeping your cat's ears healthy. The inside of a healthy feline ear is a pretty, pale pink. It may have a light coating of wax, but you shouldn’t see areas that look dirty, inflamed or crusty. The outer ear, covered in fur, shouldn’t have bare areas. Now get your nose down there and give them a good sniff. They shouldn’t have an unpleasant odor. If you start doing this when your cat is young, you’ll know what normal smells like. If the odor changes, it’s a sign that a problem may be developing. 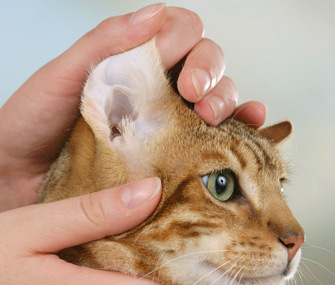 Give your cat’s ears this simple look-see (and smell) weekly. That will help you catch problems early, before they become serious. You don’t need to clean the ears if they look normal. A cat’s ears have an amazing ability to clean themselves. If you clean them too often, especially if they don’t need it, it can damage the ears' health. If the ears have a mild odor or look a little dirty, moisten a cotton ball with a mild cleaning solution recommended by your veterinarian and wipe them out. (Never use alcohol, which stings like crazy and can dry out delicate ear tissue.) Be sure you don’t go any deeper into the ear than your first knuckle. Tip: Don’t clean your cat's ears with a cotton-tipped swab. That just drives dirt and wax deeper into the ear, where it can cause problems or make existing issues worse.